Sky and Geoff Marietta are working hard to help turn the dream of a stronger economy for Eastern Kentucky into reality. LEXINGTON, Ky. (Aug. 23, 2018) — We all have met people who approach each day with "the glass is half full" attitude and who look at challenges as opportunities rather than problems. A young couple in Eastern Kentucky that certainly fits this description is Sky Marietta, an arts extension associate for the Community and Economic Development Initiative of Kentucky, or CEDIK, and her husband, Geoff. The Mariettas, who each earned a doctoral degree from Harvard University, appeared to be on track to pursue promising careers in the academic world. Yet, to quote the legendary poet Robert Frost, the couple "took the road less traveled and that has made all the difference." 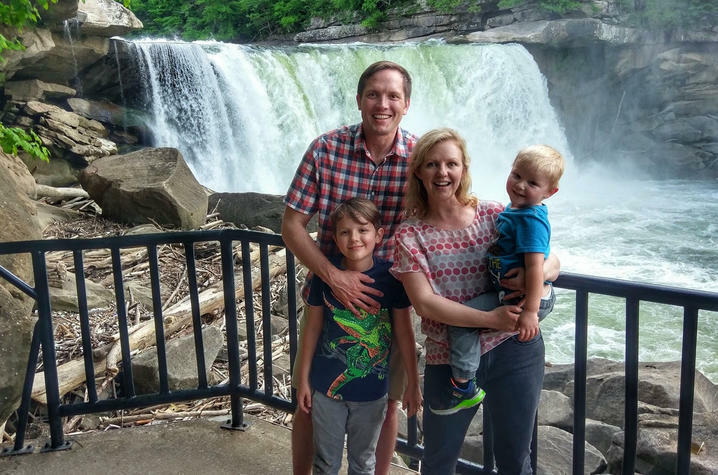 UKNow’s Carl Nathe recently went on the road with Jeff Franklin of the University of Kentucky’s College of Agriculture, Food and Environment to meet this couple and see how they are working hard to help to create economic opportunity in the mountains. Geoff and Sky Marietta with sons Harlan (left) and Perry at Cumberland Falls. Photo provided.